FANBOY PLANET.com . : Ms. Marvel Graphic Audio :. Ms. Marvel In Graphic Audio Form! My son and I have recently been getting into this form of storytelling -- for families (assuming you're all Fanboys), it makes a great way to pass the time on long car rides. You're listening to the same story together. Nobody has headphones on (never mind the image to the right). You're taking the trip together. Graphic Audio mixes regular text with actors performing the dialogue, music, and sound effects to create something quite interesting. It's not the same as comics... but it's really interesting to hear, and a great way to catch up on popular storylines that you may have missed. And I have no doubt that Ms. Marvel, already a popular character, is about to get even bigger. So why not check her out in this new media that echoes an old? Kamala Khan is an ordinary girl from Jersey City - until she is suddenly empowered with extraordinary gifts. But who truly is the all-new Ms. Marvel? Teenager? Muslim? Inhuman? As Kamala discovers the dangers of her newfound powers and unlocks a secret behind them as well. Is she ready to wield these immense new gifts? Or will the weight of the legacy before her be too much to handle? Kamala has no idea either. But she's here to stay! 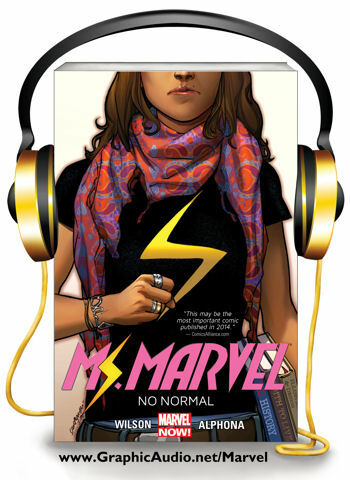 Mixed in 5.1 Surround Sound DTS and in Stereo, MS. MARVEL is available at www.GraphicAudio.net/Marvel and via the FREE GraphicAudio Access™ Mobile App which allows customers to directly download titles on their Android or iOS smartphones and tablets.